Lithic artifact analysis is a traditional method of behavioral inference in archaeological science. Though lithic analysts face many similar analytical problems, methodological communication between archaeologists working in different time periods and geographic locations is acutely lacking. This is partly due to region-specific literature and typological discontinuities that make direct methodological and technological comparisons between archaeological assemblages difficult. Open dialogue between archaeologists studying widely different temporal and geographic topics encourages novel applications of analytical methods, interdisciplinary collaborative research, and comparative approaches to technology and behavior. This conference emerged as part of a discussion carried out at the Northeast Graduate Archaeology Workshop (2010) at Brown University and includes the involvement of archaeologists from Brown University, Rutgers University and SUNY Albany. 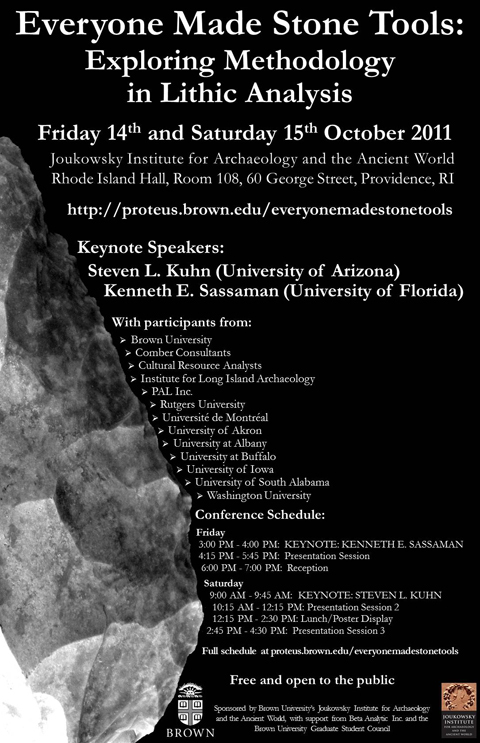 This conference, hosted by the Joukowsky Institute for Archaeology and the Ancient World at Brown University, will be held between the 14th-15th October of 2011 and will focus on creating a dialogue between archaeologists studying widely different temporal and geographic topics. The goal is to encourage novel applications of analytical methods, interdisciplinary collaborative research, and comparative approaches to technology and behavior. This will be a two-day conference at Brown University. This conference is dedicated to discussing approaches to lithic analysis, concentrating on specific results that demonstrate how different techniques function as well as their potential for broader application in archaeological studies. · Other lithic technology including ground stone, gunflints, etc. Mark L. Anderson: I am a Project Archaeologist at the Iowa Office of the State Archaeologist. I have been with the OSA for 24 years conducting archaeological investigations across the state, which have yielded everythingfrom 19th century historic farmsteads to 12,500-year-old Paleo-Indian sites. My research interests include lithic tool and debitage analysis, lithic raw material studies, geology/geomorphology, GPS/GIS applications, aerial photography remote sensing, and ancient technology reproductions and experimentation. David Bernstein is Director of the Institute for Long Island Archaeology and an Associate Professor of Anthropology at the State University of New York at Stony Brook. He has conducted archaeological investigations throughout northeastern North America, as well as lower Central America and the Caribbean. Most of his current research focuses on past coastal societies on Long Island, New York. Other areas of research specialization include prehistoric subsistence systems, the analysis of settlement seasonality, and the study of stone tool technologies. Nicholas Blegen is a Doctoral student. His fields of study include lithic technology, specifically the Middle Stone Age and tephrastratigraphy. Dr. Philip J. Carr is Associate Director of the Center for Archaeological Studies and he specializes in the prehistory of the Southeast United States and lithic analysis. Since joining the University of South Alabama faculty, he has studied the rich cultural heritage of the Gulf Coast. He co-edited the volume Signs of Power: The Rise of Cultural Complexity in the Southeast with J. Gibson, and the forthcoming Contemporary Lithic Analysis in the Southeast with Bradbury and Price. Breanne Clifton is a graduate student focused on lithic technology at the University of Connecticut. Jerry Ek is an anthropological archaeologist specializing in Mesoamerican archaeology. His research focuses include political economy, GIS applications in archaeology, preindustrial urbanism, environmental archaeology, and settlement pattern analysis. He is the director of two research projects. The Champotón Regional Settlement Survey is a multiphase regional study of the political, economic, and social changes associated with the Classic Maya collapse in the Río Champotón drainage in Campeche, Mexico. The results of this project elucidated the complex series of transformations in human-environmental dynamics, economic systems, and political networks that took place during the Terminal Classic Period within the ancient Maya polity of Chakanputun. Ek also directs and coordinates the Mesoamerican Archaeological Settlement Database project, which consists of a comparative GIS database derived from published archaeological settlement survey maps. Data from this latter project has been implemented in an ongoing investigation of urban planning and community organization in large Classic Period cities in the Maya Lowlands. His continuing research will focus on holistic regional studies of the interplay between environmental, political, and economic factors within ancient Maya city-states. The goal of this research is to contribute to the study of urbanism, sustainability, and human/environmental dynamics in ancient states by examining the unique low-density tropical urban tradition in the Maya Lowlands. Cara R Johnson: I am a Postdoctoral Fellow, my interests are paleoanthropology, geoarchaeology and lithic technology. I am interested mainly in the terminal Acheulian and the Acheulian to MSA transition. In addition I am interested in fresh water springs in arid environments and the associated archaeology. I studied at University of Connecticut and have continued to work with Sally McBrearty who is Professor and Chair of the Department. Manek Kolhatkar is a doctoral candidate at the department of Anthropology at the Université de Montréal. His current research aims at integrating the technological analysis of lithic assemblages with theoretical concerns such as identity production, skilled practice and manifestations of styles in prehistoric contexts. Mike Lenardi completed his Master’s Thesis on quartz lithic technology at Stony Brook University, and is currently a Project Director for the Cultural Resource Survey Program at the New York State Museum. He is interested in the application of morphometrics and computer vision for addressing issues in lithic artifact analysis such as typology. Daria Merwin recently finished her Ph.D. at Stony Brook University with research on submerged Early to Mid-Holocene sites in the greater New York region. In addition to her underwater archaeology studies, Daria has excavated numerous prehistoric terrestrial sites, most as Project Director at the Institute for Long Island Archaeology. Joshua J. Kwoka is a graduate student in the Anthropology department of the University at Buffalo. He received his BA from Buffalo State College in 1998, where he studied Iroquois lithics. Since then his studies have been in the Maya area, where he has worked on projects in the Yucatan Peninsula, the Peten, and most recently with the El Zotz Archaeology Project. David Leslie is a graduate student whose fields of study include lithic technology, projectile point and MSA specifically, and geoarchaeology (isotope based landscape recontruction). Jaclyn Nadeau is currently a Dissertation Fellow at the New York State Museum and Doctoral Candidate at the University at Albany, her work focuses onincorporating methods of lithic debitage analysis into the examination of the proposed technological and subsistence changes occurring from the Late Archaic through the Woodland period in northeastern North America. Jason S. R. Paling is a doctoral candidate in the Anthropology Department at theUniversity at Albany. Jason is a Mesoamerican archaeologist whose work is currently focused on the Preclassic period of the Maya lowlands. Much of hisresearch is examining lithic production, consumption, and exchange among households at the Mayan centers of K’o and Hamontun in northeast Guatemala and San Estevan in northern Belize. Jay seeks to quantitatively compare the ways in which stone tools were produced at both localities. Niels R Rinehart received his Master’s in Anthropology from SUNY Binghamton, and pursued a doctorate at UMass,Amherst, though he withdrew before writing a dissertation (ABD). He has spent most of the last 15years working in CRM here in the Northeast, but has also worked on projects in Alaska and Arizona,as well as in France, Mozambique, and Kenya. Although his professional and research experiencescover a variety of topics from the Paleo-Indian Period to 19th century farmsteads, his primaryresearch interests remains in the study of hunter-gatherers, lithic analysis, Indigenous archaeology, GISapplications in archaeology, and the region of Northeast North America. Kevin Smith is deputy director of Brown University’s Haffenreffer Museum of Anthropology. He is an archaeologist interested in complex societies, state formation, and the integration of domestic and political economies. His current research focuses on the North Atlantic, on understanding the processes that led to the creation of a short-lived independent Icelandic state, and on integrating different scale of analysis–from the molecular to the regional—in untangling past narratives and practices. Clive Vella is a doctoral student at the Joukowsky Institute for Archaeology and the Ancient World at Brown University. His previous MA dissertation was the first research-driven study in the Maltese Islands to deal with lithic tools and their subsequenteffects on prehistoric interpretation. He has numerous years of CRM and post-excavation experience in Malta and the US. His research interests are focused on the Late Neolithic to Late Bronze Age Western Mediterranean, especially offshore islands. He is also interested in examining prehistoric socio-political processes, which includes proto-urbanism and the organizational set-up of settlements, especially fortified Bronze Age settlements. Please visit the Conference Schedule page for further information and current schedule outline. This event is funded by the Joukowsky Institute for Archaeology and the Ancient World with additional support from the Brown University Graduate Student Council and Beta Analytic Inc .